Dodge Cummins Diesel Forum > 1st Gen. 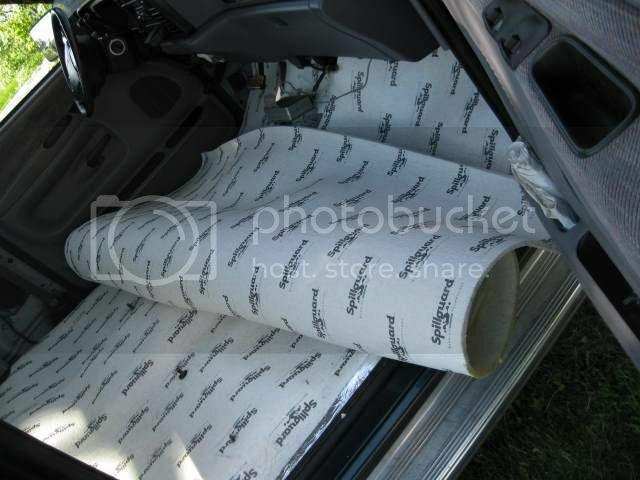 Dodge Cummins 89-93 12V Forums > 89-93 Non-Powertrain > Ideas to consider when soundproofing your truck. 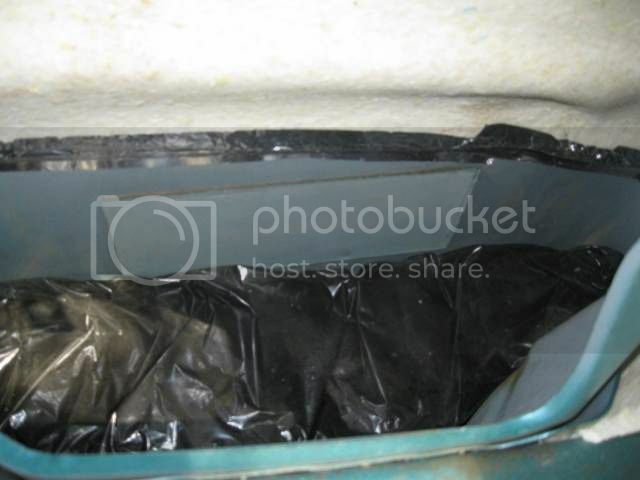 Tarpaper was actually used as a sound deadener way back when, it was thicker than roofing stuff though. Like 1/8 inch sheets for flat floors. I've used peel and stick floor tiles succesfully. Cheap ones are fine. A heat gun or killer hairdryer would be needed to soften the tiles to conform to the floor. 92 d250 le creampuff, rc auto and stone stock. When I looked at my 2nd gen truck I noticed the factory did a good job of installing sound deadener. The factory actually did a good job in this one part of sound reduction. 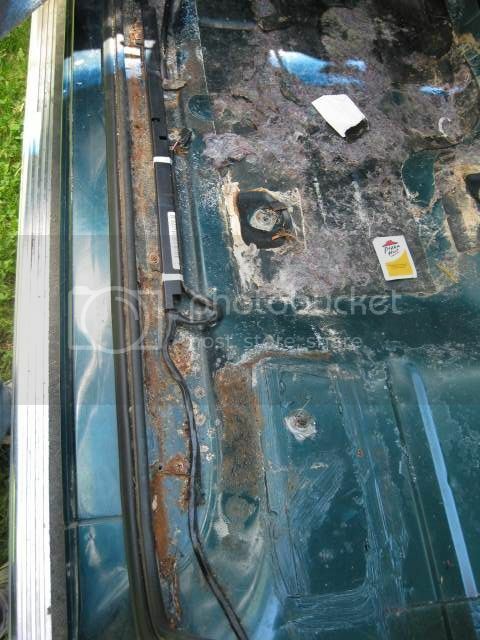 My passengers side floorpan had some minor rust. I figured that was because the cupthrower, err... cupholder had lost some drinks in the past. 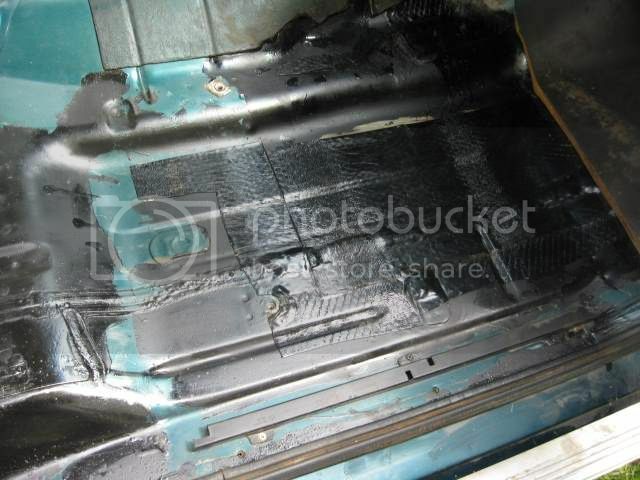 That water on the floor made the factory sound deadening loosen up. 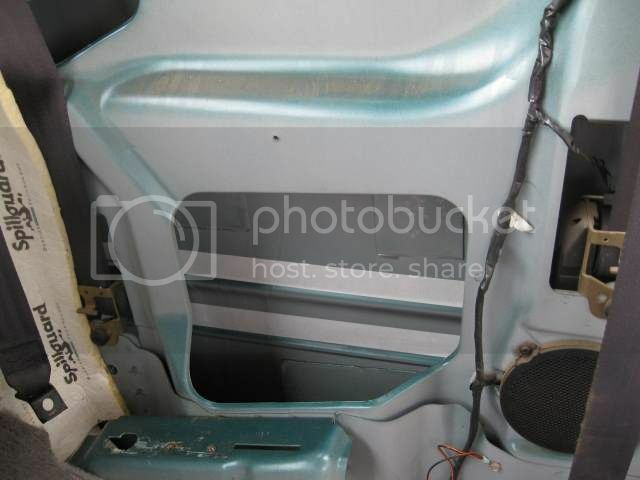 I pried that material off and installed some 3M sound deadening where the factory stuff had been. To me that was not really adding more deadener. It was replacing what had deteriorated. My truck had lots of sound deadener from the factory. 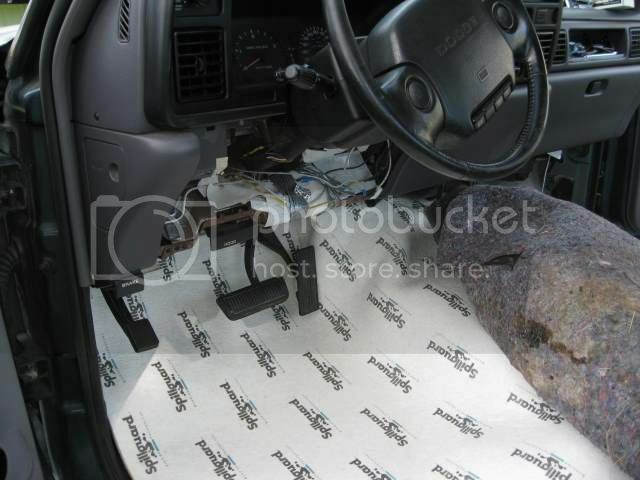 As far as I can tell every spot that needed sound deadening got it. That surprised me. 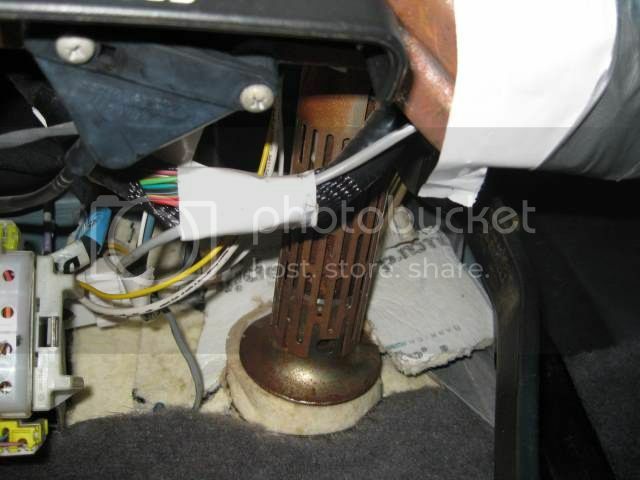 There was deadening on the transmission hump, both front floor pans, under the club cab seat, and on all the sides. 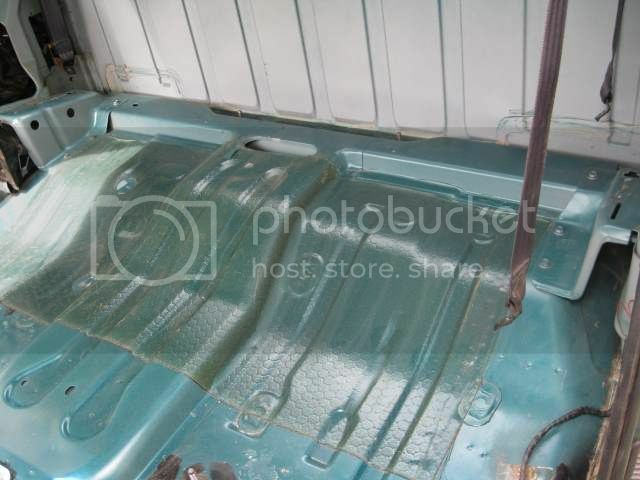 There was even sound deadening under the kick panels. 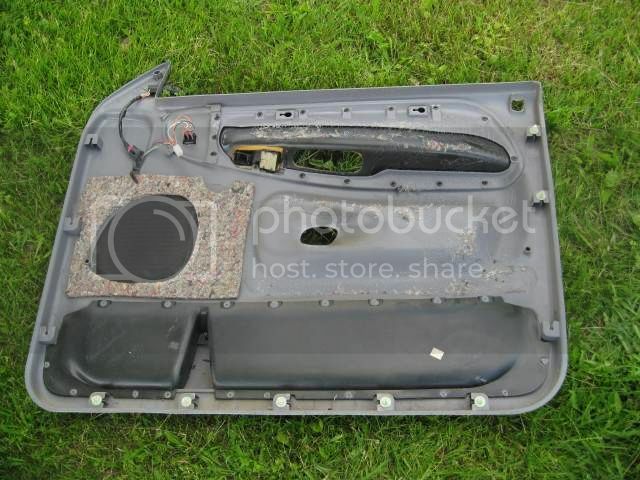 I only really replaced one bad part of the factory sound deadening. I did not look at it as me adding more sound deadener material like the CLD's. I did not use the best possible panel deadener here. I used what I found cheap locally. It was needed for such a small area I did not worry about using the best material plus it was under $10 on clearance. The one (and probably only) place the factory missed completely was the back wall. That I did put some spillguard 7/16" 8 lb carpet padding (underlayment) on. 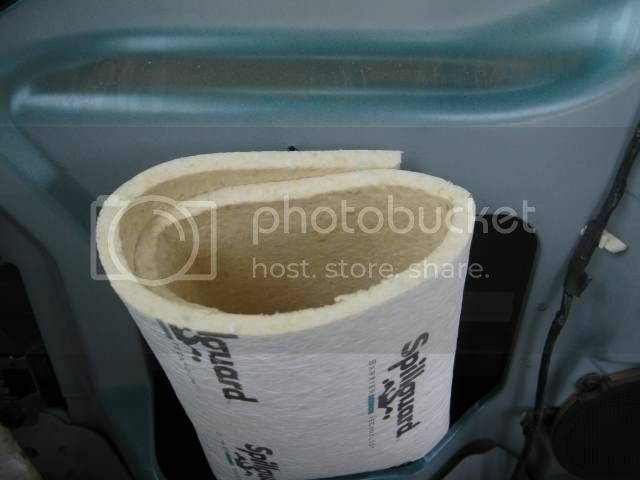 I put 2 layers of spillguard 7/16" 8 lb carpet padding under my trucks carpet. This should be easily found at most stores that sell carpeting for a house. I also added a little above the carpet on the firewall and around the steering column. 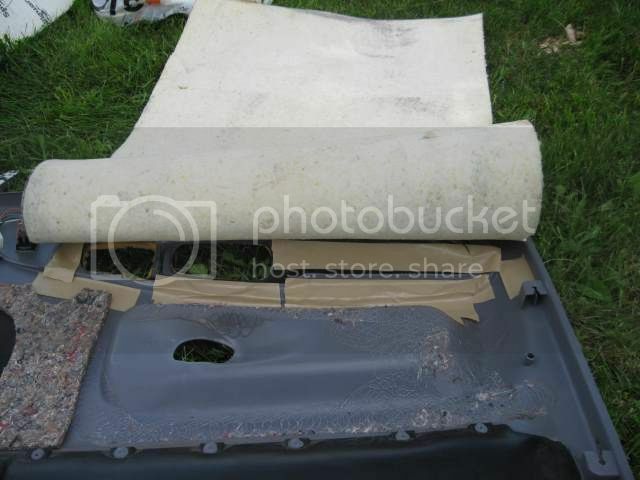 The nice thing about spillguard carpet padding is it is waterproof. It should prevent your floors from rusting with your wet feet. 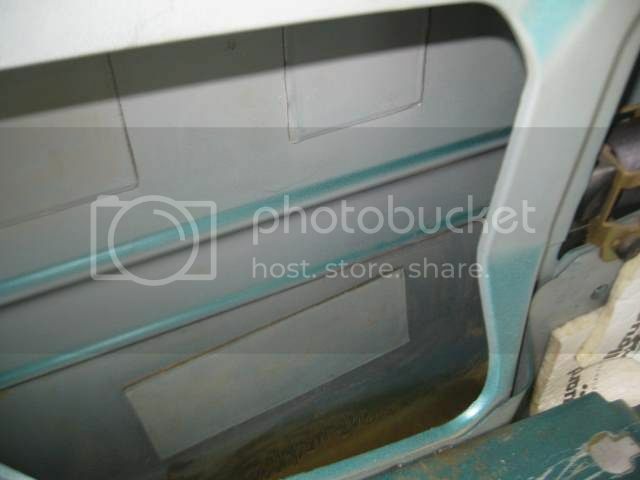 I can see that adding some under the plastic door panels would probably be a good idea. After removing the carpet expect to find some rust. Remove the rust then use a good paint. I used POR-15 as it is a rust converting paint. It looks like the cupholders did not hold the cup very well. 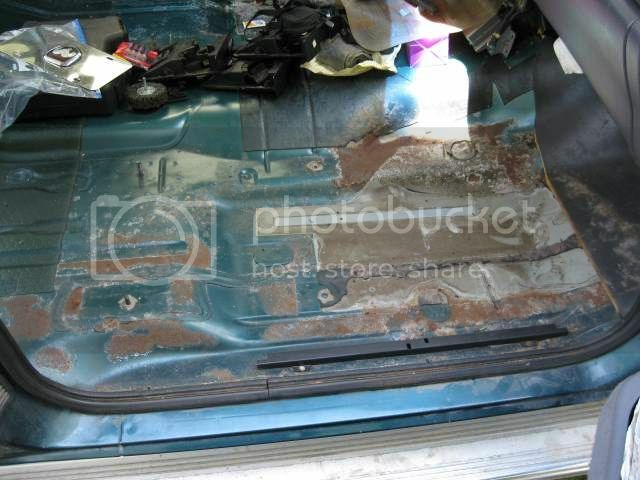 I took out the factory sound deadening on this side because of rust and it was loose. 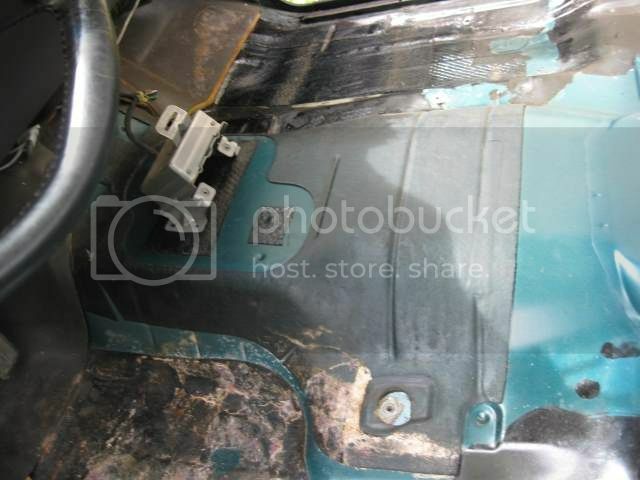 Now the rust is taken care of and the factory sound deadening has been replaced. The drivers side was better. Now it is good as it gets. 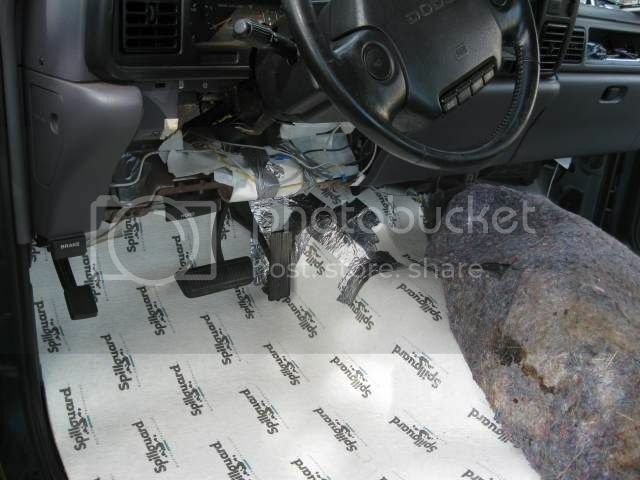 The factory actually did a good job of sound deadening on my truck. 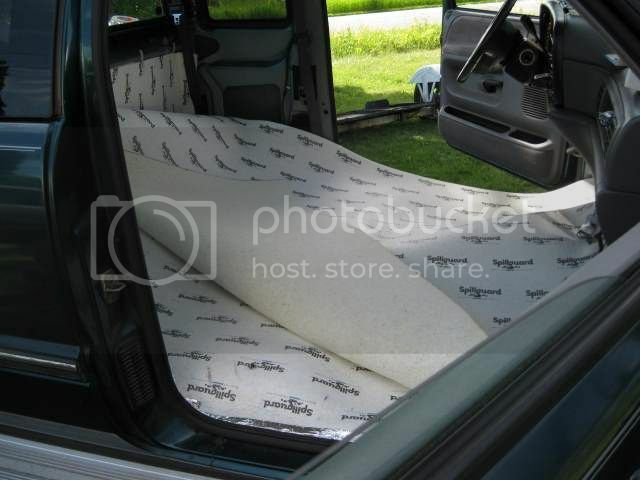 Those of you with a 1st gen may want to add soundproofing material in the areas my truck has it in. 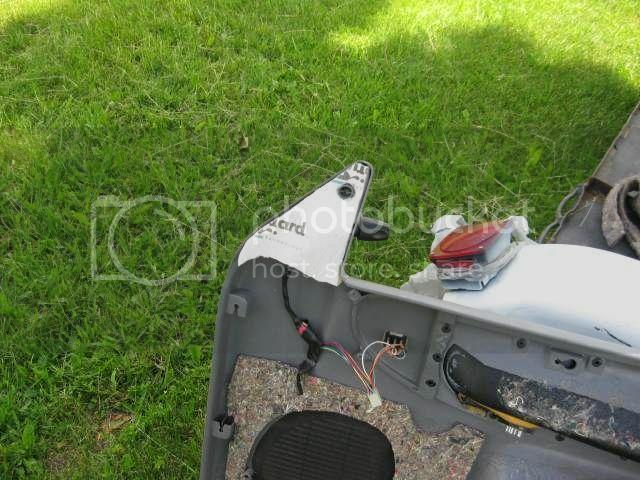 I added some extra sound deadening on the transmission hump where the factory deadening was cut out for a 5 speed and transfer shifter as I have neither one. 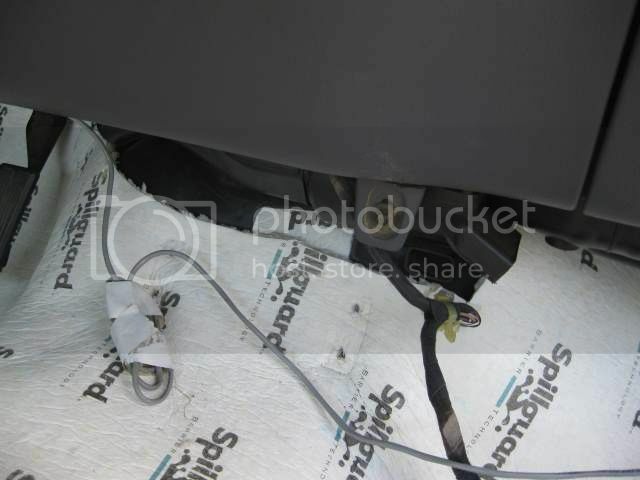 Here we see sound deadening under the club cab rear seat. It is time to add the sound absorbing material. It is called foam. 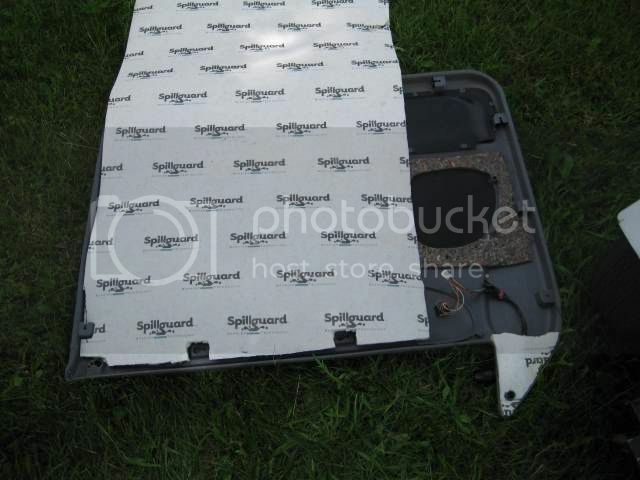 I used 7/16" 8lb spillguard carpet padding (underlayment). After applying one layer I decided to add a second layer. You should be able to find this waterproof carpet padding at most house carpet stores nationwide. Try not to order it online as shipping is far to expensive on this heavy and bulky material. Notice the studs for the seats sticking up. Be careful, they will rip your new foam if you are not very careful. Use some glue (I used Roberts double sided carpet tape) to hold more foam up in the area above the carpeting on the firewall. 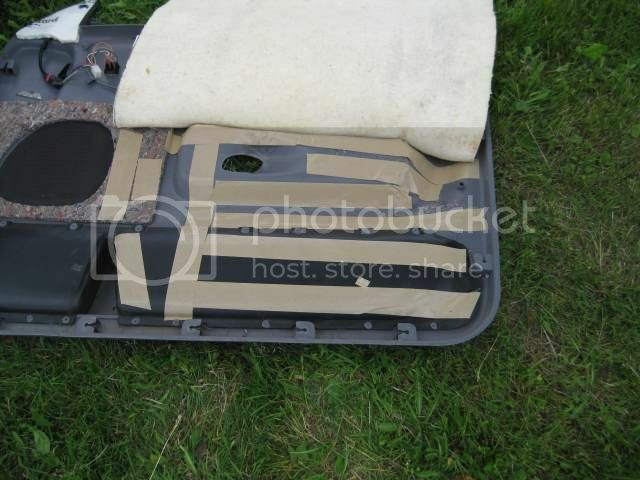 I even added some scrap foam to fill in the hole the factory left in the sound deadening material here. I wrapped a piece of foam around the steering column and added more on the firewall. The ford diesel guys say this is an important area to cover up for sound reduction. Maybe I should add a second layer of foam here. This is the hardest part of the job. Making the foam fit the transmission hump tightly. The foam did not want to lay down with 2 layers. The foam is bunched up. I sectioned the foam to eliminate the bunching. 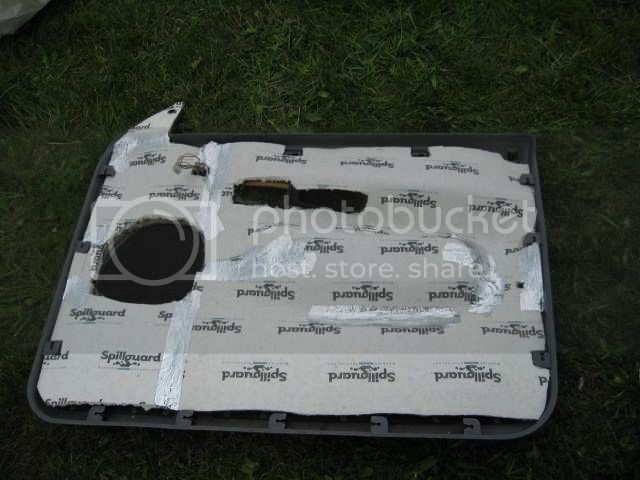 Then I used aluminum tape to hold it together and hopefully remain waterproof. 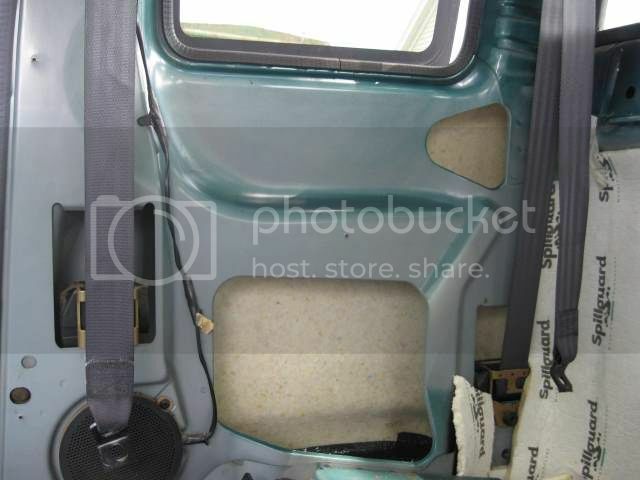 Yes, I did put some foam behind the back seat on the back wall. So far all I have done is 2 layers of foam under the carpet and one layer of foam on the firewall above the steering column on the drivers side. This is what I used to show DB levels with. The end results so far are 62-63 db at idle down from 85db at idle and greatly reduced noise on the road. My radio went from 28-32 down to 18-24. I could not hear the radio before on level 18. My grand marquis with the same exact radio usually is set at 18-22. My 1999 grand marquis idles at around 50dba. 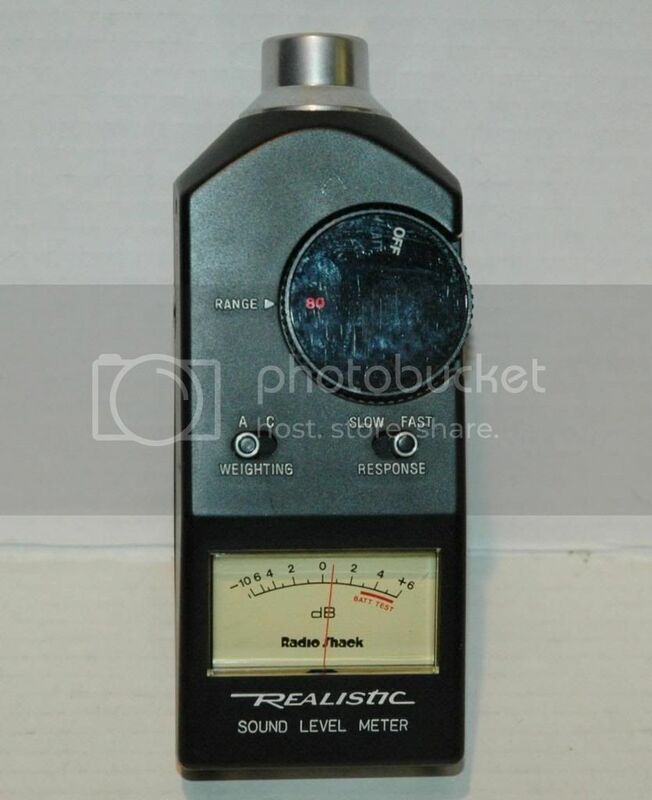 60dba with a -10 is as low as my sound level meter gets so it is hard to say for sure exactly how quiet it is. It is definitely quiet. Driving down the road my Grand marquis will get up to about 63 db below 30mph with mild acceleration. It seems to get up to 66, perhaps 68db when getting around 50 mph. Yes, I am sure accelerating hard it would make more noise. My truck now seems to be at 67-74dba while driving at 50 or less. It seems to be quieter when the torque converter is unlocked. This makes sense. I noticed that at higher rpm's the engine is quieter than at low rpm's. It may also have something to do with full engine power being applied compared to some power loss through the torque converter. You can see without a doubt that my Grand Marquis is still quieter than my truck. However, driving down the road the grand marquis is not significantly quieter. The truck used to be much louder than my car would ever be unless perhaps the exhaust fell off completely. 1999 Grand marquis 50dba at idle 63-68dba on the road. My now sound deadened 1997 dodge diesel truck 62-63dba at idle. 67-74dba on the road. Perhaps adding more sound insulation to the doors and other panels would help the truck become even quieter. I can still hear the diesel engine sound in my truck but it is not overpowering like it used to be. 1997 3500 club cab 3.54 gears towing & camper pkg. Still stock with a built transmission at 120k. 4" exhaust, 4kgsk, and exhaust brake waiting for installation. 37337 upgrade. Still need ideas for improvements for hauling 15k fifth wheel. Last edited by country_hick; 06-19-2014 at 05:22 PM. While 1st gen diesels got much more sound deadener than the gassers, there is still lot's of room for improvement. As noted, the back wall of the cab is pretty much untouched. Hick, how long have you been running that foam? is it holding up to the heat ok? I just put the foam in a few days ago. It should be fine. 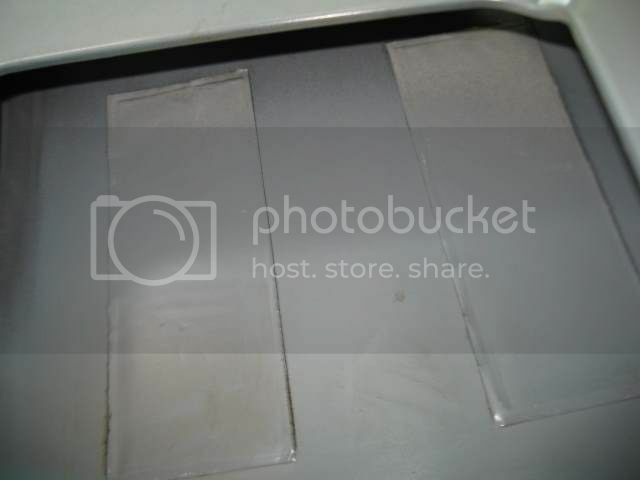 It is above the floor pan where the factory carpet is. I can not picture that getting to hot and melting. Part of the reason i chose this particular foam is it has a waterproof membrane on it. That should mean any spills cause no problems. It should also mean rain will not cause problems either when the door is opened. The back wall has no sound protection at all. It looks like the roof also has nothing in it. Apparently this is true for both the 1st and 2nd gen trucks. This is what the factory gives you on a 2nd gen truck. 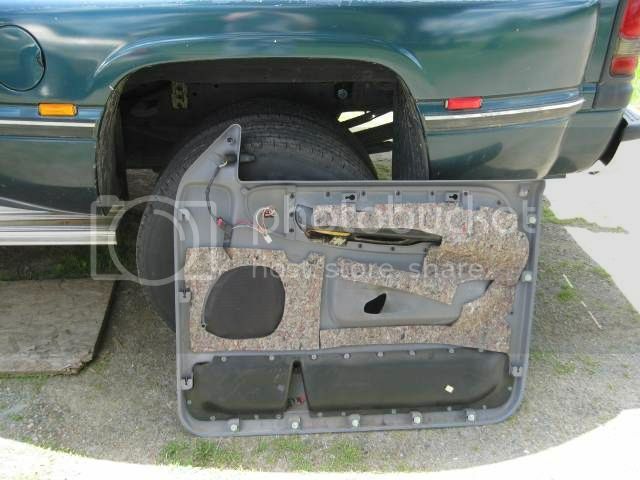 The 1st gen truck has door panels that are much easier to work with. I took off the small material and left the speaker sound material intact. I added a piece of foam where the mirror mount gets covered up. I test fitted a sheet of carpet padding. I glued down the foam at the top of the door panel. Here the curve is ready to be covered. I applied more roberts double sided carpet tape. Here the glue is ready for the foam. I patched in more foam around the speaker hole. Here the panel is complete except for cutting out the holes for the door handle and window controller. Now my door panel is back on the truck. I can not see much if any difference in dba between doing the doors or not. However, the truck should at least be easier to cool off now with the added insulation. 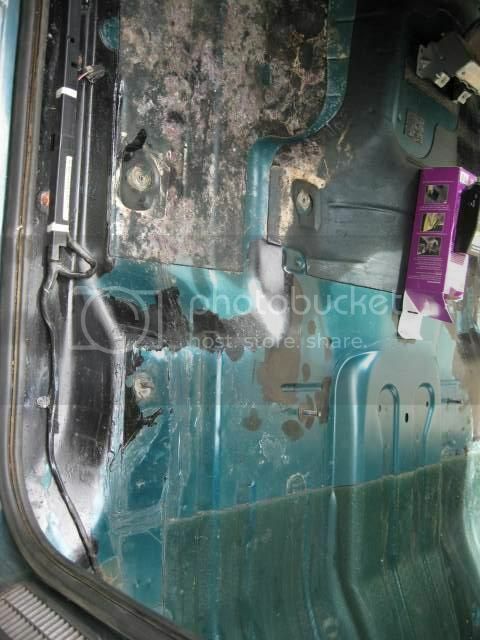 Here is why I do not see a reason to add more panel deadening to my truck. Here is a video made with the floor and both doors having foam added. Here is a video with just the floor having foam added. Here is an idle dba video with just the floor done. Here is a video showing dba at idle with the floor having 2 layers of foam and both door panels having 1 layer of foam added. Last edited by country_hick; 06-22-2014 at 11:44 PM. This is awesome,will definitely look here if I ever buy a 1st gen . 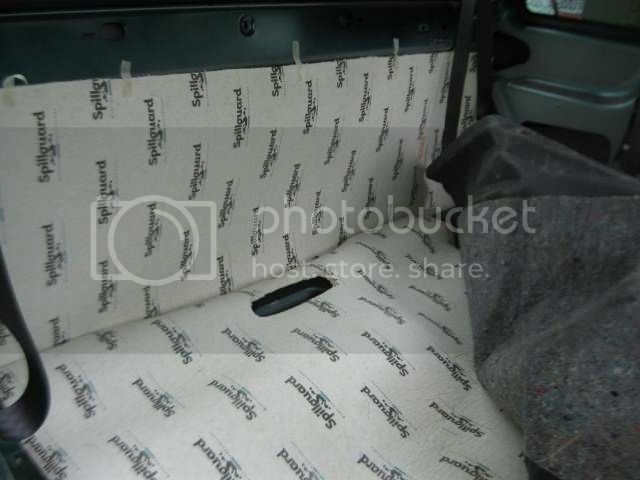 I decided to add the same spillguard carpet padding to my club cab section. First, dodge did a good job of panel deadening my 2nd gen truck. I have to give them credit for doing this much right. 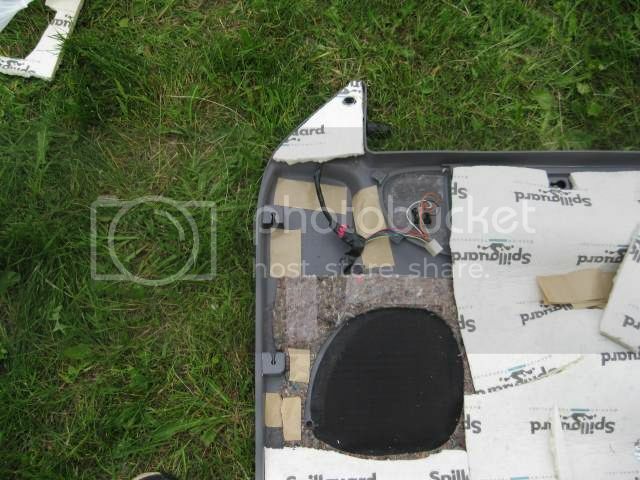 This shows how tall the sound deadening pads are up top where they are not easily seen. If your trucks lacks these add some CLD material to deaden your panel. After cleaning the metal I added 4 strips of double sided carpet tape. 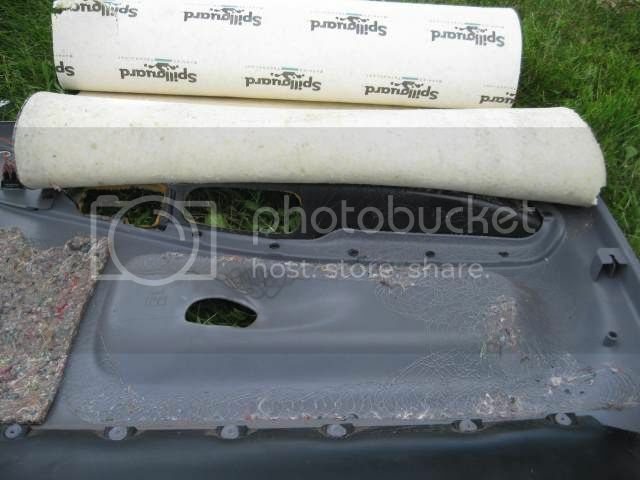 This is what is going to hold the spillguard carpet padding in place. 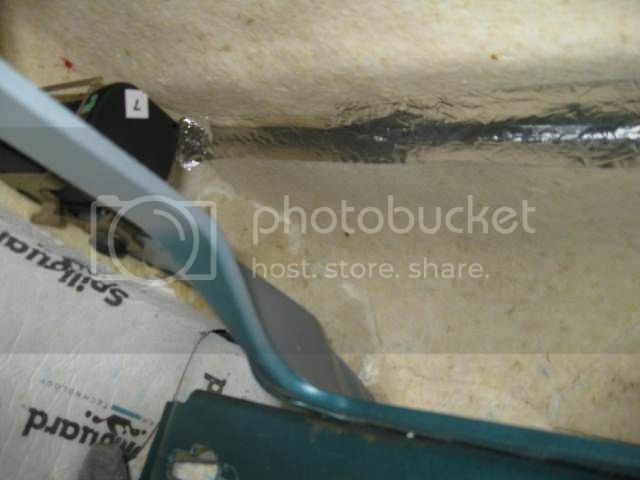 I believe in placing a strip of tape everywhere you have a bump in the mounting surface. That way the tension of the padding wanting to get away from the bump is resisted by the tapes adhesion. I discovered the easiest way to install the padding was to roll it up and then squish it into the hole. Inserting the foam as a flat piece was far to difficult. I used a piece of foam that slid behind the structural member. That covers much more area. I used a piece about 30 1/2" x 22". Then I needed more for below the bottom body line. 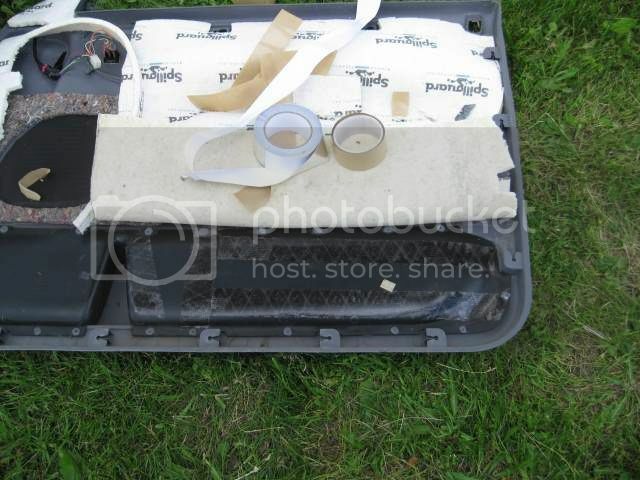 Once the foam is in place The tape needs to be uncovered. Then maneuver the foam into place. The foam will try to get out of place many times and succeed. Keep trying eventually it will be close enough. Pulling the paper covering off the tape is difficult. Everything is hidden and fighting you at this point. The sheet metal you are working near has sharp edges. Expect to get some cuts and scrapes, I did. The foam is in place on the top part of the club cab section. I used some aluminum tape to keep the bottom of the foam from collecting water. I put the factory sealed bag of soundproofing material back into place. I decided since the bag covered about everything down low I would add some more spillguard foam on the bottom. 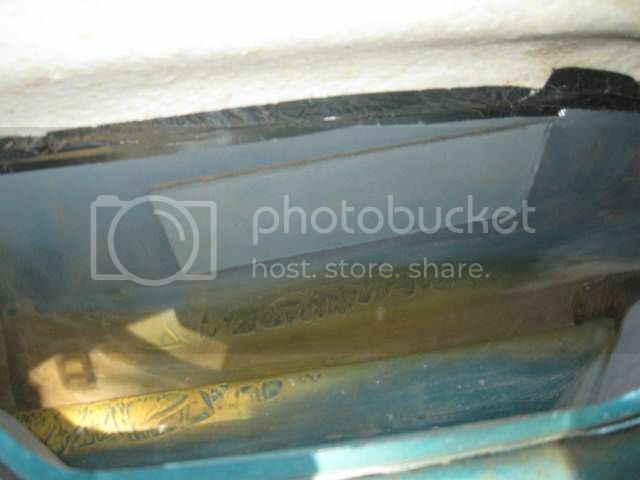 I placed the waterproof membrane on the bottom so any water that comes up from below should not cause any rust issues. I used excess scrap material and made it into a U so it mostly holds itself in place. 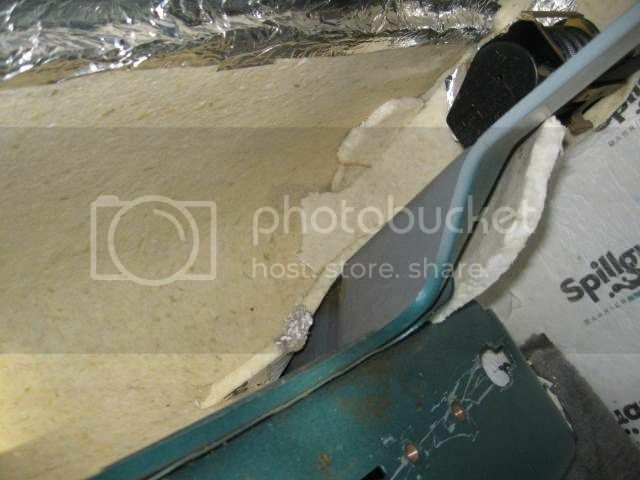 Yes, the aluminum foil tape was also used to hopefully hold the foam in place. This should help a little with sound reduction. Those who have drone should find an improvement doing this. I mostly did this to make my a/c work better. Once I add some foam above my headliner I expect to have a very cool truck in summer. Last edited by country_hick; 07-19-2014 at 07:26 PM. Nice write-up, very helpful. Since I have a 5sp 4x4, there is a large hole in the center where the sticks come out. I made a 2 piece plywood cover that covers the hole, leaving little slots for the transfer case stick and a hole for the transmission stick. I padded both the bottom and top of the plywood. Once the two original covers were back in place, there was a big difference in the amount of sound. Stock, there is only these two pliable covers that try to deaden the sound. Take those covers and go for a drive. The amount of sound that comes up from the road, engine, transmission and transfer case is huge. 04.5 Regular Cab SLT Sport, Long Bed. NV5600, 3.74, Gear Vendors Overdrive, LSD,s front and rear, Dynatrac hubs, 5" aluminum driveshaft, Steering brace, AFE exhaust manifold, Glacier Intake, Banks intake air horn, 60 hp Industrial Injection injectors, HTT stainless turbo, 08 steering, Thuren trac bar & front springs, King 2.5 shocks, Smarty Jr., and a whole bunch of other goodies. New to me on 5/5/17, 42,300 original miles. Awesome vehicle! Baja, you might get even less noise if you used a slit in some foam under the plywood. A slit is just a cut in the material. The transfer case shifter will move though that slit. The slit will close up as the shifter goes through. A slot is a continuous small hole for the shifter lever. Some noise will always get through a slot. 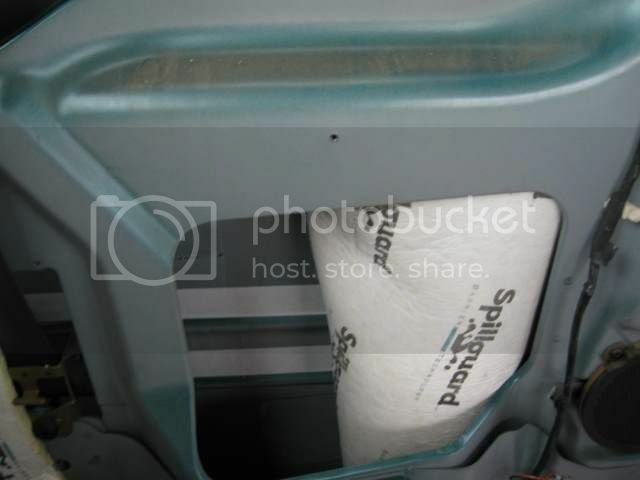 You could try gluing some foam inside the 5 speed shifter boot. Foam inside that cover could cut down the noise at least somewhat if you can make it stay in place. 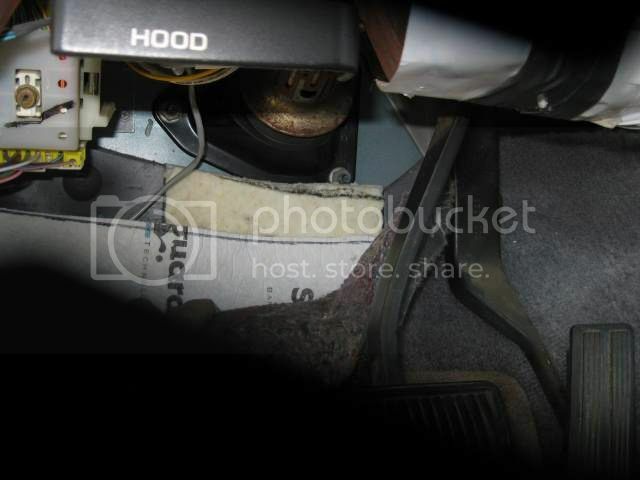 I know about the sound that comes up from a shifter hole. I once had a car with no boot on the shifter. Installing a shifter boot made a huge difference in sound levels on a (normally) fairly quiet gas engine car. I did put some foam both under and above the plywood, slitting it. The stick will move, opening foam as it moves, the foam closing behind. I also put foam around the shifter boot, filling the area around where the stick comes up through. I cut the plywood very carefully to minimize any gaps, the foam filling what was left. It is a bit of a shock how much noise will come through a small opening or crack. Made a big difference.